Only 26% of Critically Endangered and Endangered trees are reported in ex situ collections. 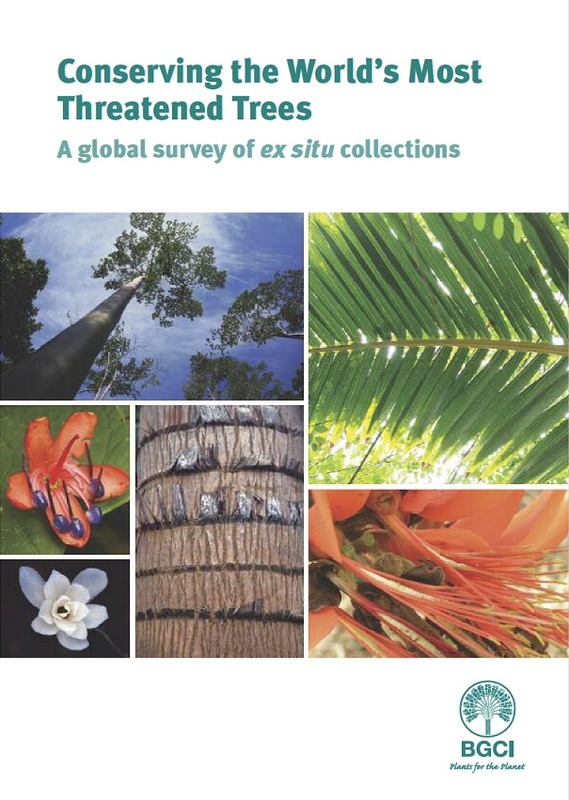 Published in October 2015, BGCI’s ex situ survey of Critically Endangered and Endangered trees highlights that only a quarter of the world’s most threatened trees are protected from extinction in ex situ collections. These results are based on an analysis undertaken by BGCI. Our first step was to develop a list of the world’s most threatened trees against which to measure progress. To do this, Critically Endangered (CR) and Endangered (EN) assessments of known trees were collated from a variety of sources including the IUCN Red List and BGCI tree red lists reports. Alongside this, a list of trees was developed, from a variety of sources including national tree lists and monographs. This tree list enabled us to extract relevant assessments from the list of CR and EN plants. Our tree list also had a final manual check by the IUCN/SSC Global Tree Specialist Group and other experts. This resulted in a list of CR and EN trees, to compare ex situ collection records against. Alongside efforts to develop the list of threatened trees, botanic gardens, arboreta and associated seed banks were encouraged to upload their latest collection information to BGCI’s PlantSearch database: an online global portal of living plant collections. This survey identified 3000 additional CR and EN trees to those listed on the IUCN Red List. This represents the best estimate of the number of threatened trees worldwide to date. This means that three quarters of threatened trees are not backed up in ex situ collections and are at great risk of extinction from stochastic events even if in situ protection measures are in place, or from extraction or habitat loss if in situ protection measures are inadequate. The full report provides guidance on which species to prioritise for collection and how to ensure collections are of greatest conservation value. The report can be downloaded here. The list of trees compiled has formed the basis for the creation of GlobalTreeSearch, a world list of trees, which will be complete and georeferenced to country-level by the end of 2016. GlobalTreeSearch will underpin the Global Tree Assessment, which will provide conservation assessments for all tree species by 2020.